Iodine may not be on your radar immediately when going vegan–it’s a non-metallic trace element most people think of as a pre-surgical topical application, for which it is used. But dietary iodine is key to the synthesis of thyroid hormones in the body. The top sources of iodine are foods from the sea and iodized salt, followed by milk and eggs. So what's a vegan to do? “For people who are eating healthier diets I would encourage people–so you may be getting all that you need just from eating land plants depending on where the plants are grown, but I would encourage people to develop a taste for sea vegetables, kind of the dark green leafies of the sea. And so for example, a half teaspoon of dulse for example, or arme is all the iodine you need for the day, there’s 150 micrograms. And dulse is just…you can get it in these little purple flakes, it’s pretty, it’s not very ‘seaweedy’. So, you can sprinkle a half teaspoon on whatever you are eating and you wouldn’t even know it’s there, you can get all that you need. and also, it’s other good, wonderful trace minerals. I hope you enjoyed hearing from Dr. Greger on this. Our actual iodine requirements are incredibly low with our entire lifetime requirements fitting within one teaspoon. However, iodine deficiency is prevalent in some countries where there are either low sea and soil levels of iodine and/or if one is eating a purely refined foods diet. 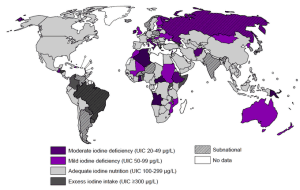 Populations that suffer from Iodine deficiency. Of course, diets high in iodized salt and fortified foods can lead to iodine toxicity, so it’s best to stay under the upper limit of 1,100 micrograms a day. If you want to track your own iodine, check out Cronometer. Just be sure to go to your profile and minerals tab to select iodine to be displayed. Because of the variation of soil and sea iodine content around the world, standard iodine content for most foods does not exist. However, if you are taking an iodine supplement or dulse, as Dr. Greger mentioned, you can create your own supplement entry in Cronometer and see its impact in your nutrition report. It’s totally free to use and pretty fantastic–so much so that they’re actually sponsoring this video post to get this vital information out to you. Be sure to use this link to go make your free profile. I don’t get any money when you click on it but it lets Cronometer know that I’m good at pimping their product. Which I may have…just completely negated…with that phrase. Now I'd love to hear from you on this! do you have concerns about iodine in your diet? Have you experienced any thyroid issues linked to iodine? Has being vegan or not impacted this? Let me know in the comments! Wonderful information. We vegans are asked all the time about nutrition requirements by people who defend their flesh eating. p.s. I love the vegan labels on your laptop. I am out of work so use a public Wi-Fi, this would be a great way for me to get the word out about veganism. it is a fun thing to have on the computer :) so glad you liked the video!